The phrase, “like wildfire,” is commonly used to say that something happened quickly. The idea…the news…the illness spread like wildfire throughout the community. But what are wildfires? What makes them any different than a regular fire? What causes them? According to Merriam-Webster, a wildfire is “a sweeping and destructive conflagration especially in a wilderness or a rural area.” Simply said, it is a large fire that causes mass amounts of destruction and is usually unplanned and always unwanted. These fires can happen at any time and can start as close as your own backyard. Check out the video below by National Geographic all about wildfire information. While wildfires can really happen anywhere and at anytime, it is important to know your risk. Combining conditions like a long period of no rainfall with high winds create the perfect environment for fires to spark and spread quickly. If you live in an area that is prone to dry conditions, pay attention to your local media stations and listen for any possible fire weather watches. According to the National Wildfire Coordinating Group (NWCG), a fire weather watch is issued to advise that conditions exist that are favorable for a wildfire or other extreme fire behaviors and may occur within the next 12 to 48 hours; however, not more than 72 hours. To learn more about different emergency alerts and how to receive them, visit https://www.ready.gov/alerts. Also, be aware of and respect any burn bans in your area. As stated, 90 percent of wildfires are caused by humans, and you don’t want to be the person responsible for a fire. Let’s start with what you should do if there is a wildfire in your area. Firstly, if you see a fire, don’t assume that someone else has called it in. It is important that fires are reported quickly so that firefighters can respond as soon as possible. Pay attention to your local authorities and media stations; be ready to evacuate on short notice. Large amounts of smoke will occur during a wildfire as well and everyone, especially if you have preexisting medical conditions irritated by bad air quality, should be sure to take extra precautions and stay inside when possible. If you are burned, seek help immediately. Make sure to cool the burns with water and and cover lightly to reduce the chance of infection or further injury. While no one is ever truly prepared for emergency, we can all do the best we can. Before there is ever a high threat of a fire in your area, you and your family should create and practice an emergency communication plan, as well as an evacuation plan. A communication plan is just that, a plan of how you can tell your family and friends what is happening and if you are safe. You should consider things like how will you contact your family if your phone battery dies or the signal is down. I suggest keeping a list of phone numbers and other contact information with you and in your emergency kit. Know where you can go if a wildfire is happening in your area by researching shelter locations. This step is especially important if you have pets, not all shelters will accept them. I would suggest finding multiple locations so that you have options if the fire spreads toward your original shelter. Keep a “go bag” stocked and ready to leave at a moments notice. If the fire is headed your way, you don’t want to have to spend a lot of time put things together to take. Individual photos of high-value items (jewelry, collections, equipment, etc. Wildfires are an unpredictable phenomenon. 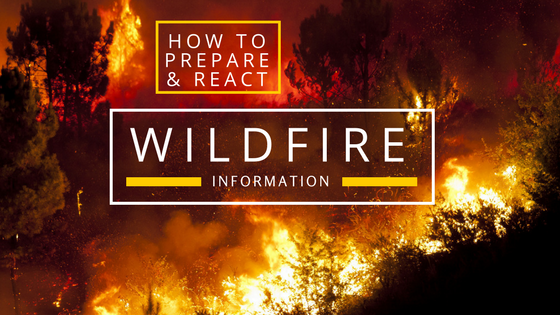 Without writing an entire book on general preparedness tips, it is hard to pinpoint all the possible things you could do to prepare for or react to a wildfire in one blog post. I will be sharing additional tips on my social media account throughout this month. I also would like to take a moment to say, “Thank you!” to the brave firefight ers out there. You all provide such a vital service and save so many lives everyday. You work long hours, especially during emergencies like wildfires, and have experienced some truly terrible situations. Thank you for your service to the citizens of the areas you represent. We are lucky to have you all!